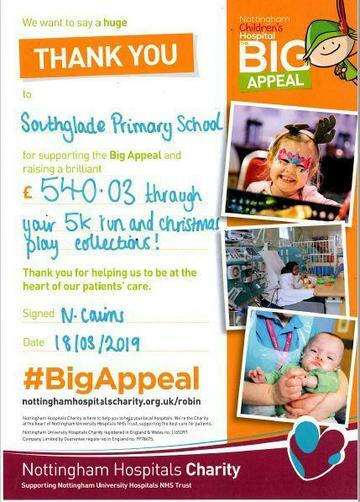 A HUGE well done to all the staff and parents who helped to raise an amazing £540.03 for Nottingham Children's Hospital. This was raised through a charity 5k run, which was enjoyed/ endured by some fabulous staff members at Southglade Primary School and generous donations from our school community following our Christmas plays back in December. Once more a HUGE well done- this effort represents the values we try and instil in our children at Southglade Primary School.